Picea is a sort of evergreen coniferous trees belonging to the family of Pinaceae. Recently a well-known tree can be met in the woods, parks and houses on the eve of Christmas and New year. 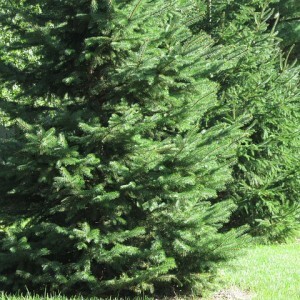 Thanks to successful work of selectors, there is a set of various decorative forms of a picea, which gives to a garden a graceful and unusual look. On pleasure of gardeners, "the forest beauty" also is unpretentious and very frost-resistant. The scientific name of the tree comes from the Latin word "pix", that is translated as "pitch". Piceas have the superficial root system. These trees grow quite slowly. In the first years they have a narrow krone, smooth bark, not resinous kidneys. Over time the crown extends, and bark becomes rough. The small seeds in the form of nuts which are settling down in ovoid cones ripen usually in the fall of the first year. Fir. All about plant. Fir variety.